Made in the USA! Also known as welding cable this very flexible battery cable can easily lace throughout an engine compartment and around tight turns with ease. Highly flexible annealed 30 gauge bare copper conductors 975 strands insulated with an EPDM jacket and paper separator. Resists abrasion cut tear flame grease oil and water. Operating temperatures is -58°F to +221°F (-50°C to +105°C). Rated to 600 volts. RoHS Compliant and meets SAE J1127. Package also includes 5 pieces of a copper lug with a 3/8" stud that fits the welding cable. Seamless copper lug made of 99.9% pure conductive ETP copper. One piece tongue (not sandwiched) make them more conductive than a typical copper lug. Clearly marked for wire size. Features a flared and chamfered barrel to ease application of finely stranded wire or welding cable. Ships same business day. 1-3 day delivery. Cable made in the USA. Includes 5 seamless copper lugs with 3/8" stud. Highly flexible EDPM jacket which resists abrasion, cut, tear, flame, grease, oil, and water. 2 Gauge Premium Extra Flexible Welding Cable 600 VOLT - BLACK 20 FEET- EWCS Spec - Made in the USA! 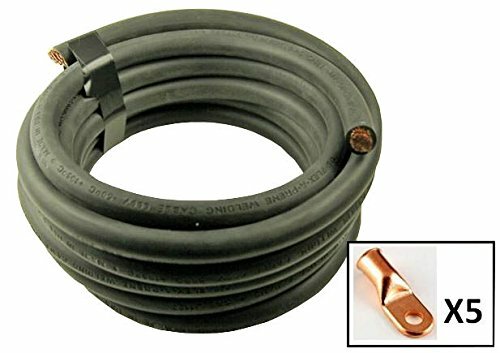 2/0 Gauge Premium Extra Flexible Welding Cable 600 VOLT - BLACK - 25 FEET - EWCS Spec - Made in the USA! 4 Gauge Premium Extra Flexible Welding Cable 600 VOLT - RED - 25 FEET - EWCS Branded - Made in the USA!